Used as a spice in cooking, as well as in natural cures and home remedies, the health benefits of garlic are numerous. From high blood pressure to diabetes, garlic has been used for centuries as an all around cure. Garlic is a perennial plant in the family Alliaceae and genus Allium, closely related to the onion, shallot, and leek. Garlic is a species in the onion family Alliaceae. Garlic has been used from a very long time for both medicinal and cooking purposes. The structure has a bulb shape, which is divided into fleshy sections, termed as cloves. Cloves are used for consumption in cooked form, medicinal uses or cloning. It has a pungent smell and a spicy flavor, which changes when cooked. Louis Pasteur was the first one to demonstrate the antiseptic property of garlic during World War 1 – opening the eyes of the world to the health benefits of garlic. Garlic is used in different forms for medicines and cooking. For medicinal use, there are capsules containing ground garlic, and it can also be taken raw with water. However, the cooked form may vary according to the different forms of cooking. It can be used in a variety of dishes to give a different kind of flavor to food. Garlic bread is the most common dish prepared by combining garlic and butter. Garlic has been credited with healing powers, much more so than any other food – this is why people of many cultures adopt it as an important part of food preparation. There can be many varieties, and many cuisines have garlic as the main ingredient. Some people like to put small chunks of the garlic pieces and some make a fine paste and add it to their food. Both ways, it adds both taste and flavor. Garlic is widely used as an important ingredient in cooking and it gives flavor to food content. Garlic granules are used for direct intake with water. This provides good digestive power to the body. 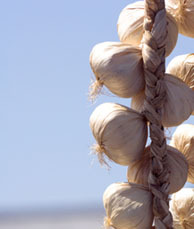 The consumption of garlic in the form of capsules or directly is a source of treatment for various infections. It is a preventive agent for cancer and heart diseases – probably one of the most important health benefits of garlic. It controls sugar levels in the human body although if you are on certain medications for diabetes it can lower your blood sugar to a dangerous level so always consult with your doctor before taking garlic supplements. There are about 50 chemicals present in garlic and some of them can activate enzymes in the liver that destroy Alfa toxin. Garlic acts as a strong detoxifier providing protection against pollutants, including heavy metal toxicity. Garlic has a measurable amount of germanium and is excellent in healing wounds. It also increases the strength of the human immune system. Although, you can derive major health benefits of garlic, there are also some precautions to be taken for its consumption. Garlic should be taken in moderate amounts, because too much of this substance can create an allergy or problems related to digestion. It is important to be particular about the quantity of garlic used in your cooking (or consumed directly in medication). There are some people who are allergic to it, and they should avoid taking it in order to prevent problems related to activation or worsening of allergy symptoms. Also if you are diabetic and taking certain medications make sure that you check with your doctor first before starting any alternative regiment. Garlic supplements combined with certain diabetic medications can lower the blood sugar to a dangerous level.